Breel Embolo scored the hosts' first goal in the competition since 2015, but a Otávio penalty earned the Portuguese champions a point. Schalke 04: (3-5-2) Fährmann; Sané, Naldo, Nastasic; Caligiuri, Serdar (Harit 84’), Bentaleb; MeKennie, Schöpf; Uth (Konoplyanaka 65’), Embolo (Burgstaller 72’). FC Porto: (4-4-2) Casillas; M. Pereira, Felipe, Militão, Telles; Danilo; Marega, Otávio (Hernâni 90’), Herrera, Brahimi (Oliveria 82’); Aboubakar (Corona 60’). SCORE: 1-0, Embolo 64’. 1-1, Otávio 75’ (P). REFEREE: Jesús Gil Manzano (ESP). Booked: Embolo (27’), Uth (53’), Corona (78’). INCIDENTS: UEFA Champions League Group D match at the Veltins-Arena, Gelsenkirchen. Attendance: 45,775. 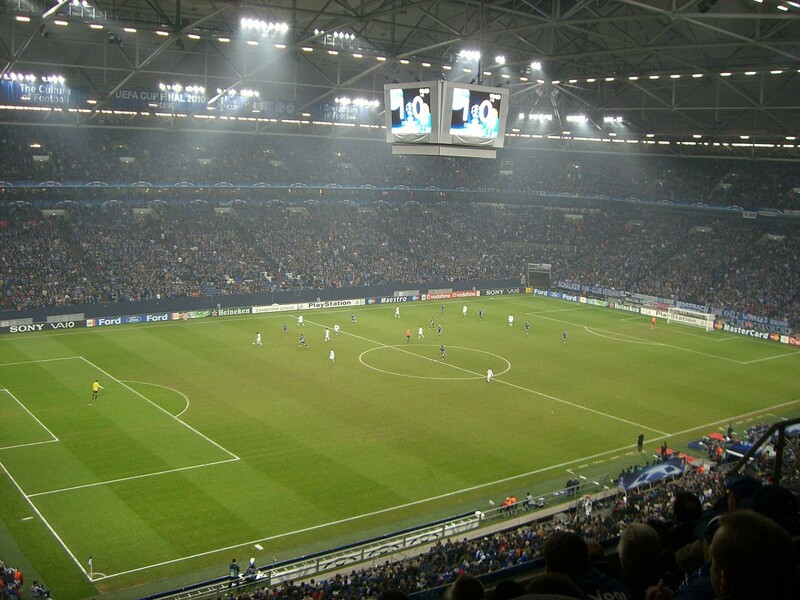 Schalke 04 had to make do with a point on the UEFA Champions League as FC Porto came from behind to draw 1-1. After Ralf Fährmann’s first-half penalty save from Alex Telles, Breel Embolo gave Schalke the lead just under 20 minutes into the second half. However Naldo was, perhaps unfairly, penalised in the box to give away a second penalty of the evening, which was converted by Otávio. After three years away, Scahlke were back in Europe’s top competition after a second-place Bundesliga finish last year, but they were without a win in three leagues games so far. Weston McKennie, Suat Serdar, Alessandro Schöpf and Embolo came in from the side that lost to Borussia Mönchengladbach on Saturday. As for Portuguese champions Porto, returning to the site of their 2004 triumph in this competition, they made just one change from their game league game before the international break, with Danilo back in place of Sérgio Oliveria. After a slow start to the game, the first drama of note came with referee Jesús Gil Manzano pointing to the spot. Telles was able to launch a throw-in for Porto into the box, and Naldo, going for the ball with his head but with his arm sticking out awkwardly, was guilty of handball. Telles took the penalty, but Ralf Fährmann came to Schalke’s rescue, guessing right and getting his hand to the ball. Schalke looked to make the most of that lifeline. Naldo met a Daniel Caligiuri corner, which came off the head of Danilo and over, although he didn’t get a corner for his efforts. Nabil Bentaleb’s shot from outside the box didn’t rouble veteran goalkeeper Iker Casillas, but the Spaniard did have to save a shot soon after from Serdar after Porto dangerously tried to head the ball out from the back. Embolo was booked after what could be described as a forward’s tackle on Tellas, with a little bit of afters between the two as well. After that though the play became bittier, with neither side having any significant attacks as the first half coasting towards the break. Porto boss Sérgio Conceição clearly told his side to take the game to the hosts at half-time and they caused them a few problems from set pieces in the opening minutes of the second half. A short free-kick from Telles was played into the box by Otávio, with Felipe’s header kept out by the foot of Fährmann. A throw-in also found its way to Vincent Aboubakar, but surrounded by a couple of Schalke defenders, he could only head to ball at the Schalke keeper. Schalke responded. Embolo struck off target after latching onto a loose ball, but an even better chance to follow. Maxi Pereira took an air shot at the other end, allowing Nabil Bentaleb to launch a counter. Serdar kept it going, McKennie broke clear of the defence, spotting Embolo in a great position to score. The Swiss striker’s shot then trickled over the line, two Porto defenders left looking at each other wondering why the other hadn’t stopped it going in. Schalke looking comfortable, Domenico Tedesco withdrew Embolo after a fine evening’s work, but the lead would vanish in controversial fashion. Naldo was penalised again in the box, giving the ball away to Otávio before appearing to make contact with his leg - although it wasn’t clear from the replays whether he actually did or not. Nevertheless, it was Otávio to step up this time, and he sent Fährmann the wrong way from the spot and Porto were level. Both sides would have chances to win it. After a Porto corner was not cleared, Otávio was able to take aim at the goal but his shot was saved by Fährmann. At the other end of the pitch, Casillas dealt with a back-flick from Guido Burgstaller, Salif Sané header over a free-kick, before Yevhen Konoplyanka connected with a Schöpf cross, only for a deflection to take it wide. That was the last opportunity, and it finished all square in Gelsenkirchen. Galatasaray take the early lead in Group D after a 3-0 home victory over Lokomotiv Moscow.